Blessed Junipero Serra, O.F.M. was a Spanish Franciscan Friar who founded the first nine of 21 Spanish missions in California, from San Diego to San Francisco. He began in San Diego on July 16, 1769, and established his headquarters in Monterey, California. Junipero was born Miquel Josep Serra in Petra, Majorca, Spain. On November 14, 1730, he entered the Franciscans and took the name Junipero in honor of St. Juniper, also a Franciscan and close companion of St. Francis. He was very learned and was appointed Lector of Philosophy before his ordination. He then received a Doctorate in Theology from Lullian University. He traveled to Mexico City where he taught. He was bitten by a snake and suffered from it throughout his life. He became famous in Mexico City for his fervent and effective preaching of missions. His zeal frequently led him to extraordinary means in order to move the people to penance, he would pound his chest with a stone while at the pulpit, publicly scourge himself, or apply a lit torch to his bare chest – burning himself. In 1768, Fr. 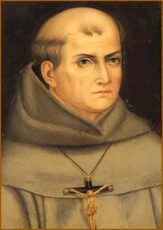 Serra was appointed superior of a group of 15 Franciscans for the Indian Missions of Baja California. The Franciscans took over the administration of the missions on the Baja California Peninsula. He was appointed as Fr. President of the missions. In 1769, he set out for an expedition to Alta California. When he reached San Diego on July 1st, Fr. Serra stayed behind to start the Mission San Diego de Alcala, the first of the 21 California missions founded under his leadership. In 1770, Fr. Junipero Serra moved to the area that is now Monterey and founded the mission San Carlos Borromeo de Carmelo. He remained there as “Father President” of the Alta California missions. In 1771, Fr. Serra relocated the mission to Carmel, which became known as “Mission Carmel” and served as his headquarters. In 1778, Fr. Serra, although not a Bishop was given dispensation to administer the Sacrament of Confirmation for the faithful in California. During the American Revolutionary War (1775-1783), Fr. Serra took up a collection form his mission parishes throughout California. The total money collected amounted to about $137, but the money was sent to General George Washington to help with the war. Fr. Serra also received the title Founder of Spanish California. During the remaining three years of his life he once more visited the missions form San Diego to San Francisco, traveling more than 600 miles by foot in the process. He did this to provide the Sacrament of Confirmation all those that had been baptized. He confirmed 5,309 persons, who were all Indians. On August 28, 1784, at the age of 70, Fr. Junipero Serra died at Mission San Carlos Borromeo. He is buried there under the Sanctuary floor. Pope John Paul II beatified Fr. Junipero Serra on September 25, 1988. His feast day is July 1st, and is Patron Saint of Vocations. Blessed Junipero Serra, O.F.M. was a Spanish Franciscan Friar who founded the first nine of 21 Spanish missions in California, from San Diego to San Francisco. He began in San Diego on July 16, 1769, and established his headquarters in Monterey, California. Junipero was born Miquel Josep Serra in Petra Majorca, Spain. On November 14, 1730, he entered the Franciscans and took the name Junipero in honor of St. Juniper, also a Franciscan and close companion of St. Francis. He was very learned and was appointed Lector of Philosophy before his ordination. He then received a Doctorate in Theology. He traveled to Mexico City where he taught. From there, he traveled up the coast of California and established missions for the American Indians. Pope John Paul II beatified him in 1988, and because he is the Patron Saint of Vocations – the SERRA clubs around the world have invoked his intercession in their ministry.